Nathan Barontini's Blog: How Science, Scripture, and the Saints Can Defeat The Seven Deadly Sins. How Science, Scripture, and the Saints Can Defeat The Seven Deadly Sins. When was the last time you heard a homily on the Seven Deadly Sins? Dr. Kevin Vost, author of Memorize the Faith!, in his latest book, The Seven Deadly Sins, has brought the “Capital Sins” right back to where they ought to be - the center of our attention. 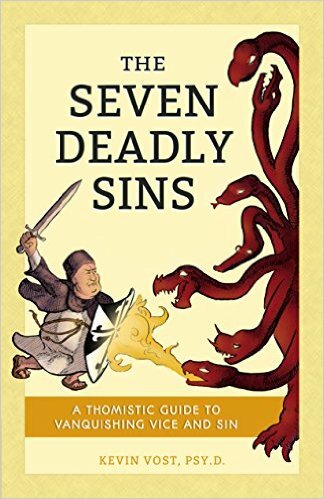 Vost first takes his readers on a whirlwind tour of the history behind the Seven Deadly Sins. Starting in the dry deserts of the East, with men like Evagrius Ponticus and St. John Climacus and traveling to the West with more famous saints like John Cassian, Gregory the Great, and Thomas Aquinas, Vost succinctly and entertainingly lays out the “family history” of this most famous list of sins. As entertaining and interesting as the first section is, it proves to be no more than an extended introduction to the heart of the book - Vost’s “Battle Plans to Decimate Deadly Vice and Sin.” Our author goes through each of the Seven Deadly Sins, following St. Thomas Aquinas’ treatment of them in the Summa Theologiae, providing tips for overcoming each vice as a means of growing in holiness. Vost doesn’t stop with drawing on the writings of the Common Doctor, however. He also provides the latest in psychology and a reflection drawn from the Venerable Fulton Sheen linking each of the Seven Deadly Sins to one of the last Seven Words of Christ. Let’s take an overview of Vost’s chapter on “Routing Wrath” as an example of his approach to each sin. Whether we’ve allowed ourselves to become irritable and easily upset. Whether we’ve dropped into sullenness, nursing old wounds, awaiting an opportunity to seek vengeance. Whether we’ve developed a general attitude of ill-temper. Whether we’ve belittled others with our thoughts or words, including insults, vulgarity, and even blasphemy. Whether we’ve been driven to act out in violence by losing our temper. Being a psychologist, Vost doesn’t end with St. Thomas’ advice from seven centuries ago, but also incorporates helpful tips from modern psychology. For wrath, Vost looks at, and expands upon, the “ABC” approach. Every outburst of wrath is proceeded by an Activating Event, Vost gives the example of a large man stepping on your toe. This event is then interpreted by our Beliefs, here that the man is an inconsiderate jerk. The event plus the belief leads to unjust anger as a Consequence. Most of us stop there, immersed in the deadly sin of wrath and about to act out on her daughters. We can, however, short-circuit this process. Instead of flaring up, we ought to continue on with Disputing our beliefs. Perhaps we see that the man was blind or, failing something as easy as that, we remind ourselves of the suffering of Christ on the Cross - endured without wrath. This leads to a changed Consequence. If the man was blind we find ourselves no longer getting angry, but instead forgiving him and perhaps even admiring his courage for going about alone. If the man was just rude, we might pray for his conversion and offer our suffering for the sanctification of the Church. Either way we’ve avoided wrath and embraced a virtue instead. Fulton Sheen used Christ’s prayer, “Father forgive them, for they know not what they do,” to defeat sinful anger. By reflecting on these words daily, perhaps first thing in the morning, we can develop a predisposition toward forgiveness and patience which will root out the tendency toward sinful wrath. We will have no chance of winning this battle if we plan to rely on our own strength. Rather, the first step we must take and never step away from is to admit that we cannot do it alone and to ask God to strengthen us with supernatural, spiritual weaponry. (p. 161). Whether you struggle with one of the Seven Deadly Sins or, more likely, all of them, Vost’s latest book is certainly worth reading. As the culture we live in celebrates these sins more and more and denounces their opposing virtues more virulently Vost’s reminder that sin can be deadly and his advice, drawn from science, Scripture, and the saints, couldn’t be more timely. The number of souls claimed by Hell through the workings of the Seven Deadly Sins is a fearsome thought. Vost’s book can help you ensure you won’t be among them. To purchase the book, and support this blog at no additional cost, follow THIS LINK to Amazon.